In 2007, I had the privilage of working on some amazing events, but Jen & Mike’s weeklong wedding celebration in Maui topped my list of favorites. Living in Minnesota, Jen did not let a few thousand miles stop her from making every detail in her ceremony personal and sophisticated. 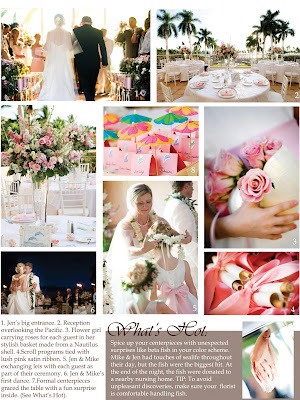 From a sunset sail welcoming guests to the islands to Jen’s favorite shade of pink donning everything from the programs to the lighting, this couple was an inspiration to work with. See some of my favorite touches below. And, of course, even if this event isn’t your particular style, take note in that it is the small touches on the wedding day that are truly the most memorable. At the end of the night, it wasn’t the over the top orchestra or the seven course meal that had people oohing and aahing (although these things are nice…) Instead, it was the unexpected treats like the fish in the centerpieces, the exclusive guest list (there were 40 people) and the personalized welcome baskets that made guests feel as if they were part of something very special. It just goes to show you that no matter the budget, with a little creativity you can make every detail all your own.